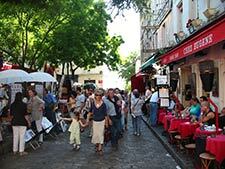 Take a private walking tour in Paris any day and discover the real Paris. Your Paris guide will meet you at your Paris hotel or apartment at 10:00 to begin the tour. Your Paris private walking tour will allow you to discover the magically hidden parts of Paris that you just can’t see from a tour bus. For example, many travelers think that Sacre Coeur and the Place du Tertre with all the artists make up an area called Montmartre. Well, these are admittedly special parts of Montmartre, but there’s way more and a private walking tour will allow you to discover what makes the area so special. Sure it’s possible to sightsee with a guide book and your metro pass, but it’s more fun to explore the City of Light with a knowledgeable and friendly individual who will tell you stories, share anecdotes, and open your eyes to Paris in a way that will stay with you long after your trip is done. Many find that along with a Paris discovery day, it’s also a day to ask questions about this and that, “to go to Metro school” to learn how the heck to use the metro, and to learn some restaurant recommendations from a real Parisian while strolling Paris. Everyone talks about the Left Bank (St. Germain, Latin Quarter and more) and the Right Bank (including the Marais for a possible Jewish area walking tour). What’s the difference? With your guide, you might decide to do a tour that will allow you to better contrast the two sides of the River Seine and then you’ll understand why both sides of the Seine have culture, shopping experiences, history, wondrous churches, and their unique charm. Are you interested in the French Revolution and the intrigue surrounding it? Paris was where it all happened and a walking tour with a French Revolution focus will help you better understand the history while wending your way through beautiful backstreets and gardens. Chocolate! If chocolate is your passion, then you should consider doing a Paris walking tour with a focus on chocolate (decadent whether light or dark!). Your Paris walking tour could be a shopping tour to learn about shopping in Paris from the small boutiques to the haute couture to the best places to find a “deal”. As much variety as abounds in Paris, so are the opportunities for a Paris private walking tour.